Ani. All images by Topden Tsering. Grief holds poorly when one is airborne. I learnt about my Ani’s passing, in Delek Hospital in Dharamsala, hours after I had booked the ticket to fly out to India from California. The three days since my first hearing about her hospitalisation had been spent in anguished indecisiveness. 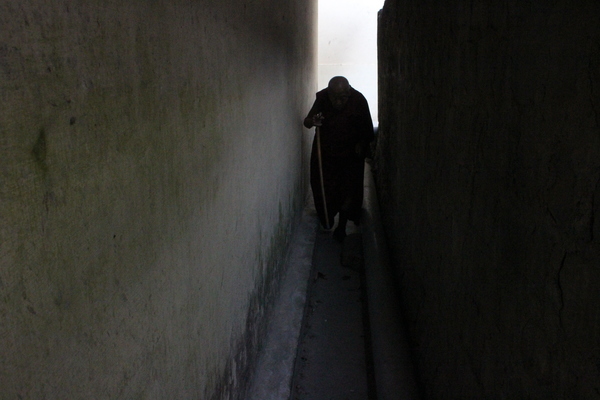 I had wanted my father to accompany me so he could say his final goodbye to his older sister, a Buddhist nun. But new concerns over his health as well as complications arising from the pending Green Card applications for him and my mother had prevented me from making an immediate departure. When I boarded the Air India flight from San Francisco to Delhi, it was too late. My seat on the plane was in the middle: between the window and the aisle. On either side was seated an Indian gentleman, each of considerable girth, their physical generosity matched by a propensity for yapping. Their inquiries, answers, anecdotes and complaints, traded in Hindi over my head were full of knowing authority, as though America had bestowed on them an entitlement which they could not wait to flaunt in their home country. I feigned foreignness, both to the language and the country, but my pretence came at a cost. I was now assaulted by an overload of information, and I couldn’t even show I was affected by it. Squeezed between the two – rendered immobile, insular – I felt like an island. Grief was its only inhabitant. It was like a boulder had been forced on my heart, cold to the touch, enormous in mass, unforgiving in weight. A deliberate effort, almost an unnatural struggle, was required of me to draw in each breath. When I exhaled, my lungs hurried to vent their fullness, as though guilty of the bounty of life left to them, as though ashamed of the accompanying noisiness. Mid-flight, some 30,000 feet above ground, it felt jarring: this feeling of imprisonment in the realm of weightlessness. On either side, there was little space for me to move, though I had hoped I could, so that the pain would be more bearable, spread more evenly across my chest. I feared the crushing heaviness of my heart would rip a hole through the plane, sending us all tumbling down. The recollection didn’t last long. Elbowed out of the frame, another image took hold. This one of a photo my cousin in Dharamsala sent me on Facebook, taken on Ani’s first night in the hospital. She was a small bundle on a wheeled bed, at the head of which sat a younger nun, cross-legged, keeping my Ani upright. An oxygen mask covered Ani’s nose and mouth, and outside it there was not much left to her face. I could not tell if her eyes were open or closed. I had never seen my Ani so sick. I had never seen my Ani looking so helpless. I tried to shut out the image – a futile effort. For distraction, I looked out the window. Reaching my hand up to wipe away my tears, I couldn’t escape a sinking feeling. I had failed my Ani. I had failed Ani by not making it on time, by not being there to bend down over her, to show her my face. The nephew she had doted on, the nephew she had raised like her son when he was a little boy, the nephew she had often told not to worry over her because she would be just fine. Upon first hearing about Ani’s hospitalisation, my younger sister Namdol in New Mexico – with whom my parents were staying and who had looked after them longer – and I decided to keep the news from our father. Ani was father’s older sister; they were the only surviving siblings, both from the generation on the other side of history – before occupation, before exile, before India. For the longest time, father had resisted coming to the States; he didn’t want to leave Ani alone in India. Mother had visited me several times before and, while she liked America, she had to return to be with my father, who in turn wanted to be on hand to look after Ani. For much of his life, between his late thirties and early sixties, father led a troubled life. Like many Tibetan men like him, he had an unhealthy appetite for alcohol, the addiction to which turned what was once a whip-smart and thoughtful man into an abusive husband, father and brother. When he turned a corner, following a fatal health scare (severe liver complications), the first penance he made was toward Ani. For the last 15 or so years – after picking up the thread of a normal life again – father, now overweight, with years of physical inactivity having left him afflicted with shortness of breath, followed a prescribed routine. 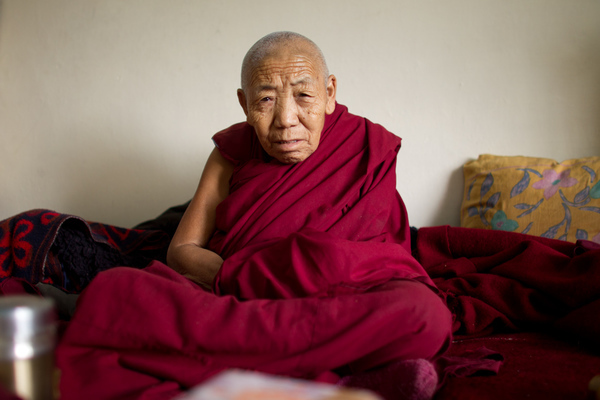 At dawn, he would leave for kora, a round of the wider circumambulation around the Dalai Lama’s temple. A rosary in hand, he would walk laboriously, stopping every so often to catch a breath. (Baby steps, Namdol would tease him, whenever we would take a walk and father would lag behind). In the afternoon, he would head for the nunnery, navigating the Bhagsu road chockablock with honking cars, taxis and auto rickshaws, his slow strides forced into sidestepping over ditches, onto storefront steps, inches away from screeching tires. All this while his hand would be carefully wrapped around the content of his bag: a tiffin carrier containing homemade food for Ani. Ironically, his schedule, when he was drinking, had been no less predictable. In the morning, father would leave the house an erect man, full of purpose. Late in the night, he would return home an inebriated mess, borne on the shoulders of fellow tavern-goers. Drenched in boisterous frenzy, he would be equally given to singing folk songs loudly in his tod dialect and shouting, in Hindi, choicest curse words – sala, benchod, bhoseri – aimed at no one in particular, but invariably stinging everyone within earshot. Ani, much to my father’s consternation, took poor care of herself. All her energy was spent in reciting Mani, reading scriptures, meditating and following a litany of spiritual observances. Bring her food and she would eat four spoons at the most, before pushing it in front of a couple of dogs and cats always at her door. There were also the birds that descended on the terrace, and the monkeys that roamed a few feet away, on the wooded trail leading to Kirti Monastery and the temple beyond, strewn with gnarly water pipes, traps for unheeding footsteps. Bring her new clothes and shoes and you’d hardly see her in them. Even in the dead of the Dharamsala winter, she refused to wear the down jackets and fleeces I would bring her, citing religious codes against garments with full sleeves. “It’s for a reason,” she would tell me, “that a Choepa’s robes are a simple affair.” A nun’s shirt is devoid of frills, consisting simply of holes to pull over one’s head and slip her arms through; her frock is layers of folds held together by a cloth belt, her shawl a billowing expanse of unassuming fabric. Consequently, Ani refused to wear anything that had zippers or buttons. No wonder then that all the Uniqlo jackets and North Face fleeces I bought her disappeared into her trunk, to be given away to lay people she knew around town “who needed them more”. Click here for the author’s 2012 essay ‘My Ani’. On account of these strictures, by the time she was in her fifties, Ani had become a sickly, malnourished woman. While the nunnery served healthy, delicious vegetarian meals, her doctor had recommended that she eat meat, for strength. Hence father’s daily routine of bringing her a meat dish, then sitting across from her, making sure she took satisfactory bites, all the while gently berating her: for sending away students and well-wishers who stopped by to help with cooking, laundry and cleaning; for letting in stray dogs and exposing herself to diseases unpronounceable; for not skipping group prayers in the main hall, down a long flight of slippery steps. Their affection led to odd exchanges. Exasperation from his side, and, from hers: a pretense of being agreeable. Not too unlike when they had been younger, when the sentiments had been reversed, the two of them inhabiting opposite roles: my Ani the dispenser of advice, my father a wall of resistance; the sister playing mother, the brother being a child full of tantrums. I can still see my boyhood-self beholding one such scene. Ani would have hurried to our house upon hearing of a fresh drunken outburst by father, its victims: my mother, my younger sisters and myself. She had meant to offer herself as a shield, an arbiter of reason. By the end of a long exchange – of reprimand, imploring and cajoling – she had herself been reduced to tears. Her calm constitution, tempered by decades of spiritual practices, had frayed in front of a man given to blind rage. Defeated, she would rise to leave, her eyes wet with tears, before clambering down the steps, while inside the house, father retained a picture of hurtful indifference. As a young boy, the utter injustice of the scene had deeply moved me. As an adult, seeing my father carry so much tenderness for Ani, I was left equally touched. As back then, now too, I am struck by the capriciousness of human conditions. By how desperately we struggle against the unforgiving ways of time. And its many incredulous tricks. A year ago, when I persuaded my father to join me in the States, he finally relented. But in this country, which my sisters and I had made our home, and which was, for most exile Tibetans, a prized destination, father existed without interest. Every other day he would ask to be connected with Ani on the phone. Some days the call would go through and you would hear on the other end a meek ‘hello’. Father would leave her a series of instructions: to eat well, to dress warm and to allow her disciples to do her laundry, to bring her food. On her end, she would respond with a ready yegh, yegh, the customary ‘yes’ bearing little sincerity. On other days, the phone would ring and ring and ring before going dead. This would make father imagine the worst. He would call my cousin and beseech him to immediately rush to the nunnery to check on Ani. His alarm would be impossible to miss, etched with the vividness of a slideshow: Ani, unconscious, lying underneath the altar; Ani, writhing in pain, fallen by the door; Ani, rushed to the hospital, where she now lay in a bed, a forest of pipes sticking into her nose, her mouth. The missed connections would be a familiar pattern. Ani would have unsuccessfully fumbled with her cellphone to locate the ‘Receive’ button; it had not helped that my cousin had, as a marker, glued a bright red tape on the incoming key. Or she would have been groping with her hands in the pile of blankets to retrieve the ringing phone, without luck while my father listened on the other end, with bated breath. On the days the calls did not go through, father would be agitated. Although he would not say it, I could sense him holding me responsible for this gut-wrenching suspense. I could sense him blaming me for bringing him over, for inserting the divide of a whole half world – spanning countries he did not have names for and an ocean he had not heard of – between him and his beloved sister. Three months ago, father, medically uninsured, had sent us into another health scare. A complaint about his shortness of breath led to a doctor friend, Cynthia, graciously giving him an examination in her house in the upscale Berkeley Hills. He had found her meticulous check-up hugely satisfying. The prodding into his mouth, his ears, the stethoscope on his chest, on his back, he found these intimacies reassuring. He was amused, and doubly gratified, when the doctor, listening to his heart, instructed him to pronounce, ‘Eeeee’; he had been proud to demonstrate his mastery of the English alphabet. Leaving the house, he expressed surprise that Cynthia was a doctor. So unassuming, he said, and dressed so simply. A full set of blood tests at a lab followed. Which in turn led to trips to various clinics for X-ray, Liver Tests and ECG. Seeing clouds of white spots on his X-ray, another doctor rushed us to the ER in a nearby hospital. For the past several days, during our visits to the numerous labs, multiple possible diagnoses had been suggested to me. Tumor. Bad liver. Heart problem. I had kept the reports from both father and mother, sharing them on the phone only with my sisters, one in New Mexico, another in New York, yet another in Elmhurst. At the ER, blood was drawn and he was put underneath the hulk of a white machine for CT Scan. Then we were asked to wait for the results. Waiting – hours slowly ticking away – by a narrow corridor, amid the blur of doctors, nurses, patients, stretchers and other equipment, father grew restless. Twice, he grabbed men in white coats by their sleeves, calling them “Dakta Saab,” and asking, in Hindi, why the long wait? When the results were read to us, father was relieved. I was overjoyed. Heart problem was ruled out, so was liver tumor, and lung complications. The diagnoses settled on high blood pressure, diabetes and breathing difficulty. Back to square one. The white mushroom shapes on his X-ray had been abrasions from some thirty years ago after he had survived tuberculosis. The faint bumps on his shoulders, his back, his legs: these, as mother had said, were reminders of his innumerable falls, in various stages of drunken conditions – into ditches, by roadsides, down long flights of stairs. “His many prostrations around town,” mother had described the black outs. Cynthia, now taking over, prescribed medicines. Father, like many Tibetans his age, has a fondness for medicine. In India, when my mother or sister had taken him to a hospital for some complaints and the doctor had discharged him without prescription, father would have become upset. “Not a good doctor,” he would declare. In McLeod Ganj, feeling a hint of headache, stomachache, etc, he would rush to a Tibetan doctor. If the doctor, after contemplating his pulse with a closed-eye deliberation, decided that father need not take pills, he would offer thanks with joined palms, before marching straight to another clinic. There, he would wait for his turn to be seen by another doctor (another contemplating of pulse with a closed-eye deliberation), determined not to leave without small plastic bags full of black and brown pills. After giving up alcohol, father had attached keen attention to his health. At 76, he is amongst the last of his generation in my hometown. In our neighborhood above Bhagsu Road, jam-packed with narrow buildings with crooked staircases, from among a dozen or so families in our vicinity, father is the only surviving pala, the remaining patriarchs having passed, some five, some ten years ago, most of them from liver complications, alcohol-related. “The Last Man Standing,” Namdol, who has spent the most time with our parents, would joke. Father gets up early to read Buddhist scriptures and offer prayers, then leaves the house – in Richmond in California when he is with me, in Albuquerque in New Mexico with my sister – for a morning walk, before returning for breakfast, after which he plops into a high chair – a tufted leather one in my house, an upholstered counterpart in my sister’s – to watch, first, all the Tibetan news services (RFA, VOT, VOA, etc) on YouTube on TV, followed by an endless staple of South Indian action films. Whether watching a proceeding of the Tibetan parliament session beamed live from Dharamsala or a Tamil-language movie showing exploding cars or people being kicked around like tin-cans, one thing is constant: the Mani wheel twirling in his one hand while the other steadfastly holds onto the remote control. Intermittently, at Cynthia’s advice, he paces around the house, even goes out for an afternoon walk, admiring spacious stucco buildings with manicured front yards, disapproving structures with wood exteriors, “like our Shing-khang before we put up a building,” a reference to the ramshackle of a house, full of holes, I was born into in Dharamsala. He follows a strict diet and, at the designated hours, happily pops the pills into his mouth. A few months after my parents’ arrival in the States, I had submitted Green Card applications for them. Father had been nervous about the time the approval process would take (anywhere between six months to a year) and the restriction it imposed on him from traveling to India, to see Ani. In the weeks leading to the US presidential election, father had watched Donald Trump on TV with befuddlement. Hearing the then-Republican-candidate-now-President’s anti-immigrant rhetoric, my parents had been alarmed. “Would our applications be harmed?” Mother had asked. “There is not a chance he’d win,” I had said. I could see father getting worried about the uncertainty that lay ahead. It was no longer just the unimaginable space separating him from Ani. Time, too, was increasingly abandoning his side. Not long before hearing about Ani’s illness, I received letters with requests for additional evidence from the US Citizenship and Immigration Services (USCIS). Prior to submitting their applications, I had been careful about ensuring completeness of the forms and supporting documents; I had gone over them again and again; I had consulted lawyers and other experts. I was momentarily discouraged; then I diligently went about gathering the requested documents. It is unlikely Trump had anything to do with this setback. Still, I could not help wondering about the question mother had asked when we watched him on TV, looking angry, pointing fingers, issuing vitriol. It is an uncomfortable idea to entertain: this accidental overlap between perhaps the most unpopular president in the history of the United States of America and my parents – the former a spiteful agent of persecution against immigrants, and the latter first-hand victims of China’s military occupation, who, now doubly exiled – first from Tibet, then from India where they lived undocumented – and in the twilight of their years, find their legal right to relocation to this new country at risk. I had just mailed in the requested papers when my cousin called me, on Valentine’s Day, about Ani’s medical emergency. Knowing that father would insist on travelling to India immediately, that he would worry himself sick, my sister and I decided to keep the news from him. Ani had been hospitalised previously after complaining about weakness, and had recovered. My mother, sisters and I hoped for the same outcome, while closely monitoring developments through my cousin. Over the next day, she had shown signs of improvement. Then she took a turn for the worse. Fast. She couldn’t talk; it was hard to tell if she recognised people. At some point, she lost control over one side of her body. The senior doctor had advised my cousin against taking Ani to Chandigarh or Delhi, six to twelve hours away. She wouldn’t survive the ride, the doctor had said. Abandoning any thought of bringing father along, I booked the tickets to Delhi, then onward to Dharamsala. I was to fly the next day. Later that evening, driving to a restaurant in Berkeley, I had thought about Ani’s loss of movement of the right side of her body. One of my favourite things to do, when visiting Ani in her room in the nunnery, had been to put my head in her lap as she sat cross-legged, twirling with her left hand a rosary half-buried in a red cloth pouch. This was her precious rosary from Tibet from when she was a young nun – a gift from her teacher. It had been blessed by many lamas, including the Dalai Lama, and having thumbed over the beads millions, perhaps billions, of times, she strictly followed a belief of not exposing the mala made sacred by a long and complex series of ngag, tantric spells. Snuggling up to her, I’d put her free hand in mine and gently rub my fingers over her knuckles, her palm. Looking perplexed, reciting Mani under her breath, Ani would break into a curious smile. Then, she’d untangle her hand and, raising it closer to her eyes, inspect it closely, as though she were seeing it for the first time, perhaps looking for the cause of my infatuation with it. My cousin had described to me how Ani had responded, upon waking, to her not being able to move her right hand, the same hand I had held many times. In the Delek Hospital in Dharamsala, Ani had struggled to raise her head from the pillows, her left hand twirling another rosary, to look closely at her unmoving limb. What had gone through her head? Shock, panic, or reconciliation? I wouldn’t know. Out here in the traffic on Solano Avenue, my eyes trained on the cars ahead, my one hand on the steering wheel, from my other free hand I had felt Ani’s fingers slowly slipping away. I had not been prepared for it, I had been praying for Ani to wait for me. Holding the lump in my throat, I rushed to find some privacy between parked cars, and cried. What had so far been stuck in my throat, trapped in that mysterious cavern where pain breeds, now came out in loud sobs – an unwieldy ululation. My eyes were a window streaming with raindrops. A thin film of water covered the sidewalk, the car tires, and the ATM by the side of which I sat. Moments later, my phone rang again. It was Namdol. Having had come to the end of her hold on secrecy, she had relayed the news to father who now came on the phone. Father was surprisingly stoic. It struck me that despite his alcohol-blurred years during his prime, despite the later affection he carried for his sister, he was a man surrendered to faith. In a matter of minutes, that brief continuum vacillating between here and gone, he had yielded unquestionably to the present arrival of death. He was no longer the one who needed protecting. It was I who needed it, with my dubious hold on the belief system of my father, with my need for Ani to be forever around. ~ Topden Tsering is former editor of the Tibetan Bulletin and former president of the San Francisco chapter of the Tibetan Youth Congress. He writes for various publications, including the San Francisco Chronicle, the Outlook, Global Post, and the India Site. This piece is an edited chapter of a book in the making. ~ Click here for an earlier essay by Topden Tsering recalling his childhood memories of his aunt published in Himal Southasain in January 2012. Wonderfully touching and beautiful writing – thank you! I could not stop reading, drawn into each moment. Thank you for sharing. Your writing took me along with you. Excellent. I hope your memories of her bring comfort.